Our chiropractic website is especially designed for health-conscious people in Syracuse. 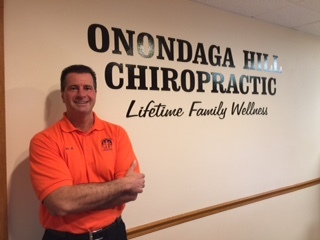 Find out why other Syracuse-area residents are choosing the chiropractor committed to patient education and understanding in Syracuse. Dr. Ancone spent the time to explain what he was doing, how the spine fits into over all health and what I could expect. He also explained that this is a process that we’d work together on reducing my discomfort. I appreciate being fit in on such short notice. This first visit was fantastic for alleviating my pain. You guys are excellent, and I feel that I actually have hope of living a pain free life! The staff is so happy and friendly! I look forward to my appointments! Dr. Ancone is very interactive and explains everything he is going to do or is doing. Very interested in learning about his patients. Just a great experience. I recommend Dr. Ancone. Everyone at the practice is beyond amazing. I’ve had back issues for a while and I not only get help for my discomfort, but I enjoy coming in each visit and seeing everyone in the office! Very friendly and personal service making me feel welcome and not just another patient, Thank you!